The temps seem to be cooling down slightly here in the Northeast, and it is hard to believe that September is already here! I am huge lover of fall and welcome the season with open arms. With summer fizzling out, I decided to end my summer salad series with a bang by featuring a salad that showcases a great deal of beautiful seasonal flavors. This salad is a riff on the traditional taco salad, which is typically loaded with cheese, sour cream, guacamole, and meat of some sort. Delicious, yes. Healthy, no. So for a lighter seasonal spin, I bring you the vegan taco salad featuring, walnut chorizo, cashew sour cream, jalapeño lime dressing, and plenty of colorful seasonal veggies mixed in. When taking photos of this salad and food in general, the surface makes all the difference. For me, nothing beats a simple veined surface which adds life and depth to the photos that I am taking and the story that I am telling. Countertops contribute a vibrancy and life to food photography, and Silestone helps by providing a variety of textures, styles, finishes, and colors that help to achieve just that. If taking photos of your food is not your primary reason for selecting a countertop, Silestone surfaces can evoke feelings that are classic and clean, bold and dramatic, or romantic and refined. I fell particularly hard for Lusso, which is pictured in all the photos. Whether you are actually redoing your kitchen or bathroom surfaces or just dreaming about it, Silestone provides endless inspiration. The inspiration for this salad came from the usual place, my CSA loot. I had received some beautiful corn, yellow and red bell peppers, and crunchy romaine. I knew that these ingredients were destined for a salad, but I wanted to take a Mexican style spin on things. Thus, the veganized taco salad came to life! While studying at the Natural Gourmet Institute for Health and Culinary Arts, we had a Raw and Living Foods class. We made many incredible dishes that afternoon, but the raw nachos featuring walnut chorizo were one of my favorites. I could not believe how meaty and seasoned the "chorizo" tasted, and this salad felt like the perfect opportunity to feature this raw food. If you have leftover "chorizo", toss it in a breakfast taco or add it to a burrito. 1 cup cherry tomatoes, quartered if large, sliced in half if small. To make the chorizo, cover the sun-dried tomatoes with warm water and let soak for 15 minutes, or until soft. Drain and roughly chop. Place sun-dried tomatoes into a food processor and pulse gently. Add the rest of the ingredients, and continue to pulse until the mixture is crumbly. Be careful not to over process and turn into a paste. Taste, adjust seasonings if needed, and transfer to a bowl. Let sit for 15 to 30 minutes, allowing the flavors to meld. For the cashew sour cream, blend all the ingredients together in a food processor until smooth and creamy. To make the salad dressing, blend all the ingredients together in a blender or place into a mason jar and shake well. To assemble the salad, place 3/4 of the dressing into a very large serving bowl, add the romaine lettuce, and toss to combine. Scatter the beans, corn, pepper, tomatoes, scallions, avocado, and chorizo over the lettuce. Drizzle the sour cream and a little more dressing on top. Serve immediately. *If you do not have a chance to soak your cashews or walnuts for 4 hours or overnight, simply place the nuts into a pot with water. Bring to a boil, turn off heat, and let stand covered for 30 minutes to soften. This will prevent the "chorizo" and "sour cream" from being raw, but it is an option if you do not have a chance to soak your nuts. This post was created in partnership with Silestone. 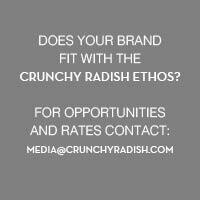 Thank you for supporting the sponsors that support crunchy radish.